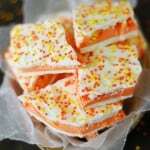 If you like candy corn, you are going to love this Candy Corn Truffle Bark recipe! 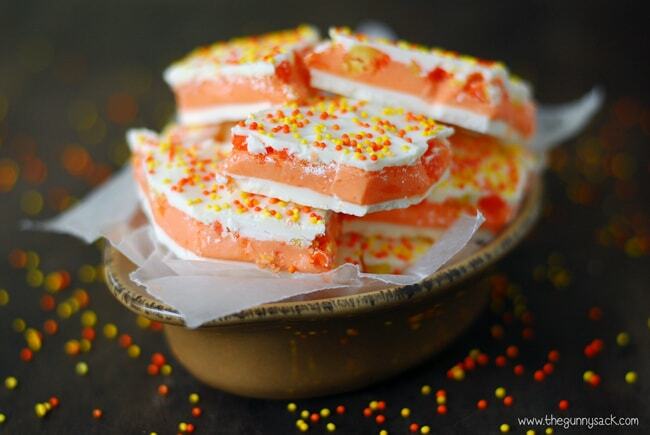 Candy corn is one of the essential candies for fall! It was the first Halloween candy that I noticed in stores this year. I’m not sure how they got their product placed with the school supplies but it was there. Our favorite way to eat candy corn is to mix it with dry roasted peanuts. Someone once told me that the combination is supposed to taste like caramel apples?! I never got that but they taste great together anyway! A couple of year ago I started seeing all of the recipes online for homemade Butterfingers using candy corn and peanut butter. That is when I first discovered that you can actually melt candy corn to use it in recipes. 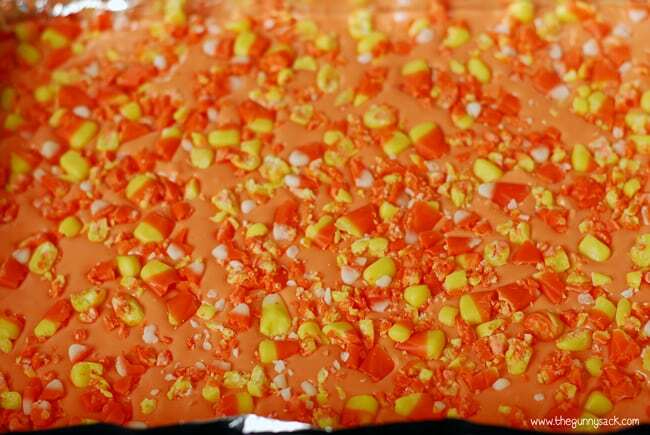 I decided to use melted candy corn to make Candy Corn Truffle Bark. The smooth, fudge-like truffle center is a mixture of melted candy corn and vanilla frosting. First, melt 7 squares of vanilla almond bark in the microwave. Heat for 1 minute and 30 seconds, stir and then continue heating and stirring at 15 second intervals until smooth. 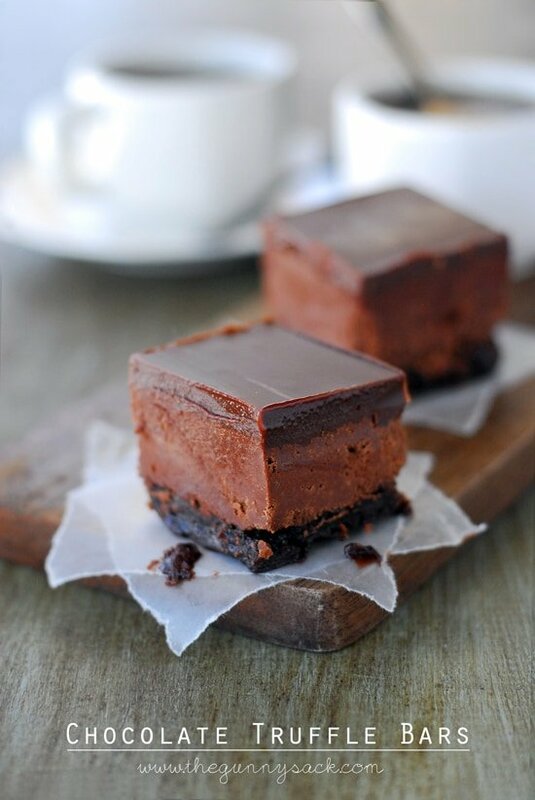 Spread into a foil lined 9×13 inch pan. Allow the almond bark to set. Next, melt 2 cups of candy corn in the microwave. Heat for 1 minute, stir and then continue heating and stirring at 15 second intervals until smooth. 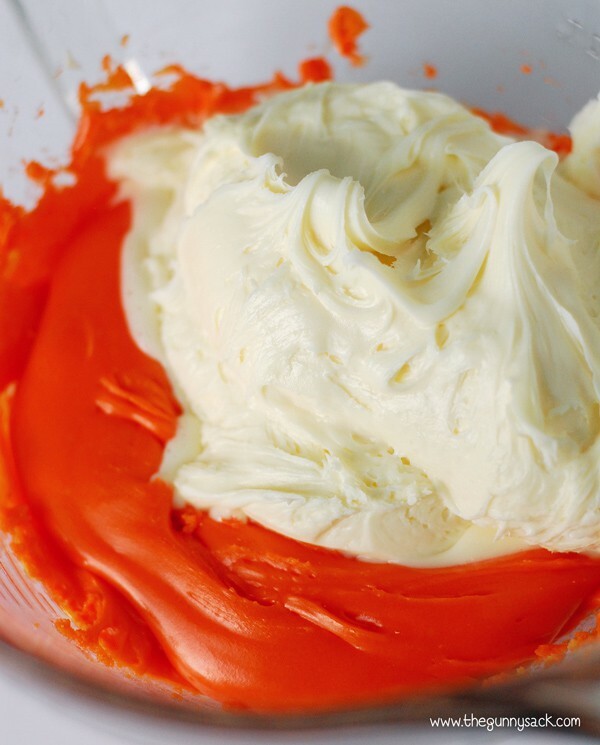 Mix in 1 container of vanilla frosting. Spread the mixture over the vanilla almond bark layer. Top with 1 cup of chopped candy corn. Gently press the candy corn down into the truffle layer. Melt 5 pieces of vanilla almond bark in the microwave. Heat for 1 minute and 30 seconds, stir and then continue heating and stirring at 15 second intervals until smooth. Spread in a thin layer over the candy corn layer. 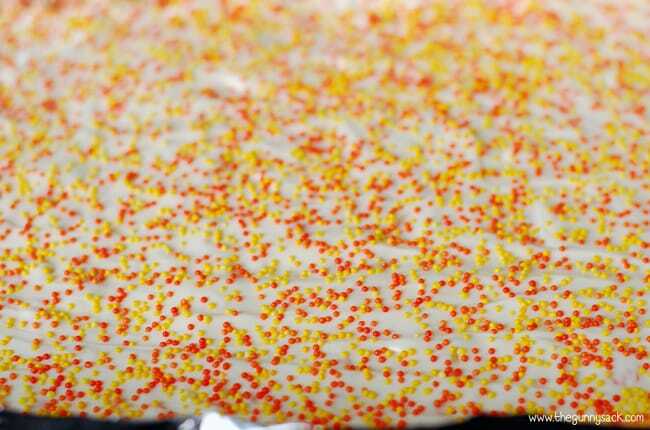 You want this layer to be thin so that the candy corn truffle bark is easier to cut. Top with orange and yellow sprinkles because they are so cute and because they hide any imperfections in the top layer. 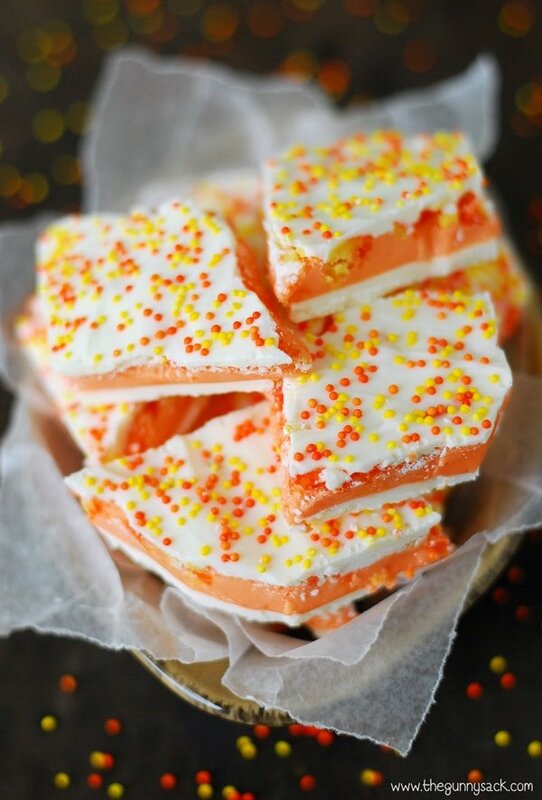 Allow the candy corn bark to set. Remove the bars from the pan by lifting with the foil and then cut into pieces. Once I started cutting these bars, the almond bark started to crack in random ways. 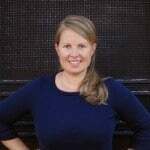 I went with it and followed some of the cracks, making a similar cut in the bottom layer. 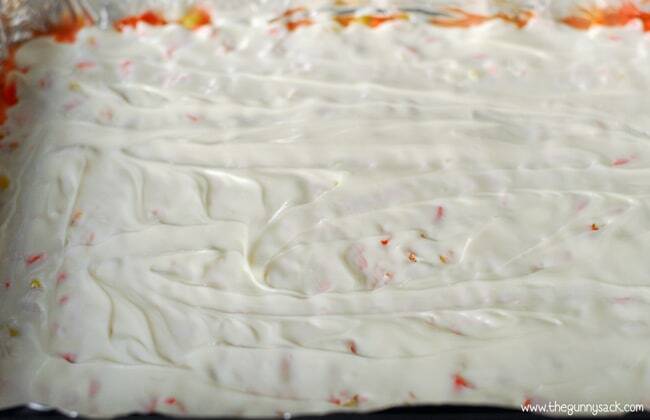 Melt 7 squares of vanilla almond bark in the microwave. Heat for 1 minute and 30 seconds, stir and then continue heating and stirring at 15 second intervals until smooth. Spread into a foil lined 9×13 inch pan and allow the almond bark to set. Melt 2 cups of candy corn in the microwave. Heat for 1 minute, stir and then continue heating and stirring at 15 second intervals until smooth. Mix in 1 container of vanilla frosting. Spread the mixture over the vanilla almond bark layer. Top with 1 cup of chopped candy corn. Gently press the candy corn down into the truffle layer. 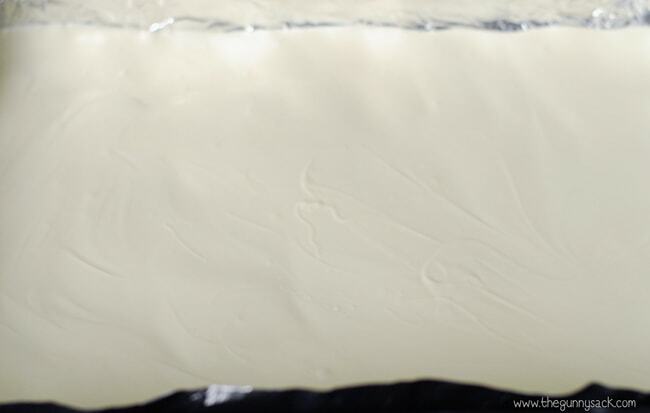 Melt 5 pieces of vanilla almond bark in the microwave. Heat for 1 minute and 30 seconds, stir and then continue heating and stirring at 15 second intervals until smooth. Spread in a thin layer over the candy corn layer. 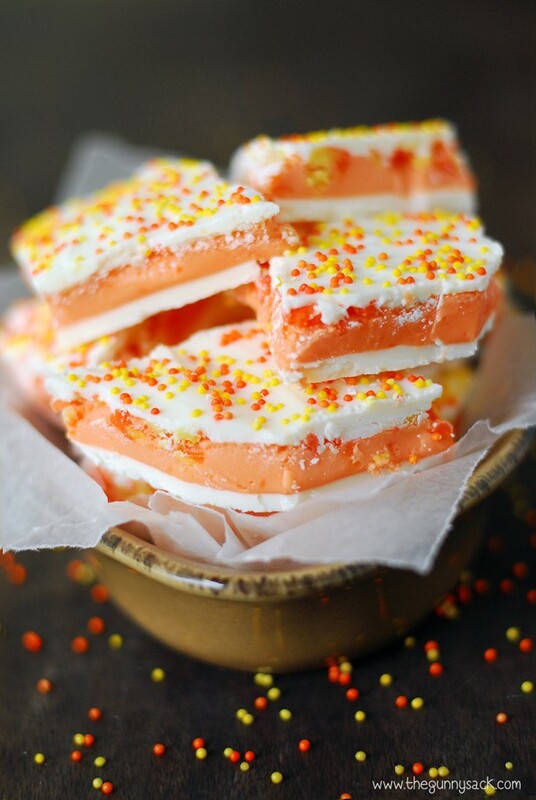 Top with orange and yellow sprinkles. 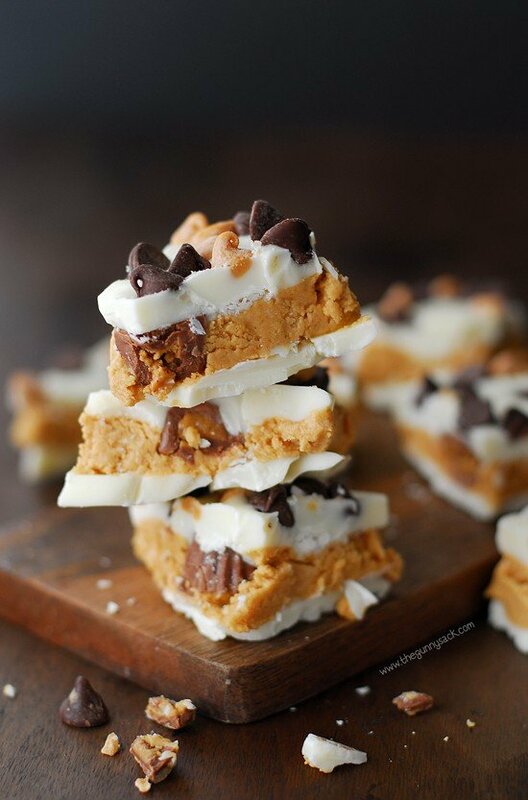 can you use white chocolate instead of almond bark? I’ve never tried it, but it should work. You might have to add shortening to make it spread better. Here is info about melting and adding shortening: http://www.ghirardelli.com/recipes-tips/working-ghirardelli/dipping-candymaking Best of luck! I tried it with white package and just used a bag of 12oz of white chocolate chips and it worked out pretty well, it only took about 1min 45sec. To cook and it spreads out really smoothly. So cute and festive. I love this! This bark is incredible!!! This looks so perfect for Halloween! This looks awesome! Candy corn was always my favorite as a young kid, but I think now I like this version even better!